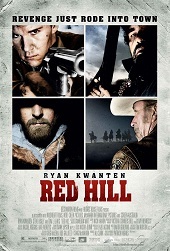 Shane Cooper (Ryan Kwanten) is a young police officer who relocates with his pregnant wife Alice (Claire Van Der Broom) to Red Hill, a small Victorian one-horse town in outback Australia. Cooper is dreaming of a future life in his new tranquil surroundings. However, the couple's dreams are shattered when news of a prison break sends the town into a tail spin. 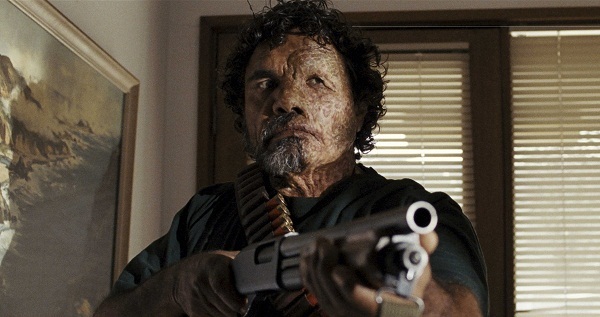 The escapee, Jimmy Conway (Lewis) is an Aborigine serving a life sentence for murder and is heading straight into town. In the ensuing battle, the local police officers are gunned down one by one. Cooper begins to suspect that Red Hill is hiding a terrible secret, especially when police chief 'Old' Bill (Steve Bisley) refuses to call any reinforcements. Cooper has to fight for his life, and ultimately, to save his family. The scene is set for an explosive final showdown. Red Hill is independent filmmaker Patrick Hughes' first feature film, which he also wrote, edited and co-produced with Al Clark. Hughes makes no secret of the fact he always loved westerns, and admits that in making the film, he was influenced by such films as High Plains Drifter, and No Country for Old Men. He set out to create a contemporary western that would evoke themes of revenge, redemption, and sacrifice. The result is Red Hill; a modern western/action thriller set in the old gold mining town of Omeo in the beautiful Gippsland highlands, with the whole action taking place in a single day. The film also has strong elements of horror; from a distance, Conway's horribly disfigured face is reminiscent of Michael Myers from Halloween, or even Leatherface from The Texas Chainsaw Massacre. The big draw of the film is of course, Ryan Kwanten, fresh from his recent success as Jason Stackhouse in the smash hit TV series True Blood. However, what's more intereseting is the casting of legendary Aboriginal actor Tom E. (Tommy) Lewis, the star of Fred Schepisi's The Chant of Jimmie Blacksmith (1978) – a role that has many similarities with that of Jimmy Conway in Red Hill. Lewis also featured in Igor Auzin's We of the Never Never, and more recently, September, Crocodile Dreaming, The Curse, Bad Habits, and The Proposition. His portrayal of the terminator-like Conway is simply brilliant. Steve Bisley is superb as the cold-hearted, tough-talking police chief; one again, he demonstrates how effortlessly versatile an actor he could be. For a brief moment (very brief that is! ), Cooper mistakenly believes that his greatest challenge in Red Hill would be dealing with his new boss. Van Der Broom appears only briefly as the pregnant Alice, her conversation with the injured Cooper when he returns home to retrieve his gun providing the film's only comic relief. Tim Hudson's cinematography is absolutely stunning; his camera work brilliantly captures the mistiness and the beauty of the Victorian high country. The end result is a remarkably atmospheric film, but it’s not without its flaws. A subplot that introduces a semi-mythic panther, for instance, is hard to follow – one feels that Hughes was just trying a little too hard. And Cooper sometimes seems a little too fair from the action as Conway wreaks his destructive path. Considering Red Hill is Hughes' first feature, the once director of TV commercials has done extremely well, and should be very proud of his efforts. With a perfect cast, and brilliant cinematography, Red Hill may be just what the doctor has ordered for the Australian film industry, which has had its far share of struggles in recent years. Highly recommended.